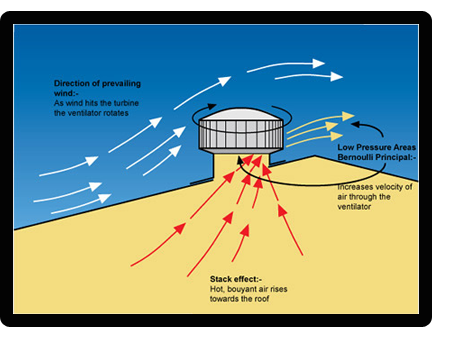 Warm air , carrying high concentrations of water vapor , which is drawn by a process of convection to cool the building's roof , including spaces . Without adequate ventilator condenses water vapor , resulting in the rotting wood , the rusty metal furniture , feel hurt and mold growth . To resolve this issue costly , Lama brick manufacturing a wide range of quality products suitable breathing roof construction for new and upgrade scenarios . Roof ventilator can help extend the life of a commercial building or industry by providing proper airflow. Heat and humidity regulation with a fan in the attic. Ventilate the hot air exhaust fan with a belt drive. Use a roof curb to the fan when you need to create a strong seal leakage. Select an option from our choice of roof measuring breathing to suit your own needs . Environmentally friendly : the roof ventilator fan efficiency We , explosion-proof , no noise and sparks, do not use electrical energy . Anti- dust : Wind turbine exhaust fan continuously operates 24 hours a day . This reduces dirt adhesion and makes it easy to clean the rotor . Light weight : The weight of the roof ventilator is about 15kg , so users do not need to take it into consideration when designing steel structures . Daylight : the space between the blades allow natural light to reach the delivery efficiency of the light of day , thereby reducing electricity costs by 5-10% . Reliability : Roof breathing We have a lifespan of more than 15 years . The curved blade is the result of scientific computing. They not only absorb rain water also contributes to the high efficiency. Will perform the operation blades rotate smoothly in case the wind is not less than 0.2 m / s and the temperature difference between indoor and outdoor exceed 0.5 ℃. In addition to flat roofs, roof Ventilator We also can be used on slopes (≤ 31.5 °). The special design of the turbine blade center pivot effectively stop spinning at high speed to cause deformation, thus extending the life of the roof mounted ventilation fan automatically. Roof breathing automatic assembly We can easily be installed on the concrete roof panels, roof contour of the various industrial plants without any frame. For roof ventilator fan does not require the cost of electricity, the cost of maintenance costs and low installation, it can save significant costs of users. Di radiant and convection . Reduce heat in a closed room , and increase air flow into the house . Breathing roof installation work in parallel with the air conditioner cooling performance improvement . Using inside air via ceiling ventilation to feed a roof ventilator device, encourages hot summer air from outside via windows, doors and other points of air leakage to come inside, overloading your air conditioning system. The home does not have an endless supply of cooler air available for ventilating through a whirly bird, which always seems to be assumed. Humidity also comes from outside. Extremely ventilator homes are just as susceptible to mould as air tight non ventilated homes. The best solution to fixing mould problems is installing, effective and efficient ventilation, that should also reduce temperature swings inside the building. Humidity sensor fans in the bathroom with door ventilator grill, and efficient use of an externally vented kitchen range hood. Exhaust fans need to be installed in a way to allow ample air to move the humidified air out quickly. Putting a vent in the bathroom door allows the fan to leverage from air leakage throughout the whole house, instead of just the bathroom. Much like evaporative cooling vents, if you install a vent inside your home on your ceiling for hot air to move up through a Whirly bird, you may need to get up on a ladder to close it and open it a few times a year, which could be risky, especially for the elderly. These installed vents may not be very air tight when they are closed. In winter, moisture can be a problem in the roof, make sure bathroom fans and kitchen range hoods are ducted outside into the soffit, or straight through the roof itself. This is a more fool-proof way of getting moisture out of the home, instead of using a roof ventilator device to get rid of this high temperature high humidity air which can cause problems in roof cavities. A roof ventilator device with indoor ceiling ventilation, can contribute to additional pollen indoors causing health problems such as hay fever or asthma attacks. Prior to insulation being widely used in Australia, old roof ventilator devices used to have Fans inside them, but nowadays most cheap versions do not. In homes/sheds that have no ventilation and insulation, a Roof ventilator could make quite a difference, but in todays modern age of insulation, they are no longer of viable benefit in the majority of climates. If you really wanted to ventilator roof cavity right, Ridge cap ventilation is capable of moving much more air with a much larger surface area opening, as apposed to a single roof ventilator to effectively lower the temperature of the roof area in combination with under eave ventilation.